View Cart “Eze Lap96SFBench Stone – 2½” x 11½” / 1200grit” has been added to your cart. The 0350 is hands-down, one of the most popular ZTs ever — and with good reason. From fast and easy assisted opening to a secure liner lock and premium S30V blade steel, the 0350 packs a lot of features into a size many users prefer, especially for an EDC. But sometimes, a guy has got to put on a suit. And that’s when he needs the 0350SWCF with its über-classy carbon fiber handle scales and stonewashed blade. The S30V stainless steel blade offers durability, corrosion resistance, and wear resistance. Stonewashing gives the blade a textured, matte look. Carbon fiber handle scales, both front and back, provide a sophisticated look and a smooth feel. 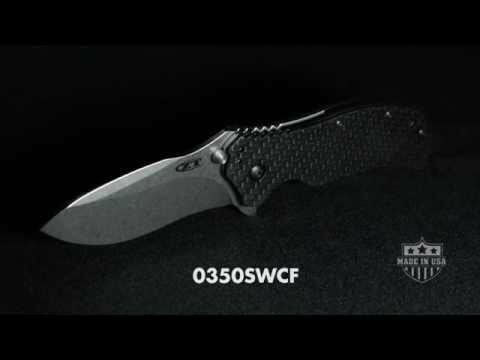 The 0350SWCF opens quickly with the patented SpeedSafe assisted opening system; just use the ambidextrous flipper to open the knife with ease. Zero Tolerance’s quad-mounting system enables all-position pocket carry, too. With its sleek carbon fiber handles and stonewashed blade, the 0350SWCF is a built-tough ZT that’s at home on the worksite or out on the town.